From thousands of amazing artists, the 80 LEVEL editors painstakingly whittled the nominees list down to 80. Nominees from around the world include brilliant character artists like Blair Armitage and Luana Bueno, to environment artist Christoffer Radsby and seasoned VFX artist Andreas Glad. Now, 80 Level is revealing these top contenders, available at awards.80.lv. The nominees will be voted on by their peers and fans, and winners will be announced on January 15, 2019 on the website at 9am PT. 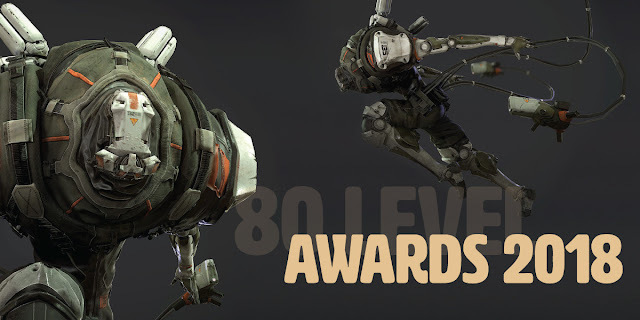 "At 80 LEVEL, we are always looking to find new ways to help, promote and advocate our fellow artists and developers," said Kirill Tokarev, publisher and editor-in-chief of 80 LEVEL. "These awards are just one way we can praise not one, but the entire artists-in-gaming community. The artists are constantly raising the bar in their fields, so we're helping to build awareness and celebrate the amazing work that they do every day."